With screens and kiosks connecting people in the busiest urban areas, smart cities are changing the way we live our lives. We are proud to be working with a leader in the smart cities revolution and we are committed to helping digitize many more cities around the world. Intersection, the leading smart cities technology and media company, today announced it has selected Broadsign International, LLC’s leading marketing software to power advertising on Intersection’s network of digital displays across the U.S., including LinkNYC and transit assets in the top media markets, to improve advertisers’ ability to reach consumers with targeted, seamless campaigns. Intersection will use Broadsign’s content management system, Broadsign Control, to deliver advertising and dynamic HTML5 content to its national network of digital displays. From a unified platform, Intersection will be able to manage branded content on more than 3,500 Link kiosks, urban panels, interactive station platform displays and bus shelters it operates nationwide. Intersection’s network reaches over 48 million consumers across the top DMAs in the U.S., including New York City, Chicago, San Francisco, Philadelphia and Dallas, and several other top metro regions. This network includes signage throughout major transit systems such as the Chicago Transit Authority (CTA) and the Southeastern Pennsylvania Transportation Authority (SEPTA), as well as New York City’s LinkNYC Wi-Fi kiosks. The Intersection digital display network, which generates 2.5 billion impressions per month, is the ideal platform for advertisers to share their brand stories. To more efficiently manage and sell ad space, Intersection will also use Broadsign’s sales platform, Broadsign Direct. Broadsign’s leadership in DOOH advertising will help Intersection and its partners to connect with consumers in even more creative, dynamic and meaningful ways. Increasingly, cities around the world are installing connected technologies and devices to improve the urban experience. According to the Outdoor Advertising Association of America, OOH innovations like Intersection’s digital assets can help cities deliver Wi-Fi, transit information, emergency communications and other critical services to residents and visitors. Intersection’s growing network of digital assets enables cities to provide these critical services free of charge. With engaging and informative content, including real-time transit updates, weather, local events, and contextual, dynamic advertisements, the Intersection network is one of the most noticed and relied upon in the U.S.
Broadsign is the leading digital out-of-home (DOOH) marketing platform that enables brands, agencies and DOOH media publishers to buy, sell, and deliver DOOH campaigns efficiently, reliably and securely. Lighting up airports, shopping malls, health clinics, street corners and more, the Broadsign platform powers screens at the heart of people’s lives and delivers more than 11 billion ads and 30 billion impressions per month. The Broadsign marketing platform includes Broadsign Control for content distribution, playback and proof of performance, Broadsign Direct for sales inventory availability and proposal generation, and Broadsign Reach, a customized SSP for programmatic DOOH transactions. Intersection is at the forefront of the smart cities revolution, improving the experience of public places through technology that provides connectivity, information, and engaging content and experiences. 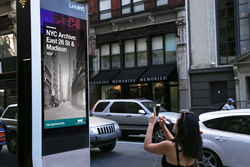 With award-winning products like LinkNYC, the largest and fastest free public Wi-Fi network in the world, Intersection connects the digital and physical worlds, enhancing people’s journeys through their cities and offering brands the opportunity to drive more relevant and engaging advertising, rooted in real-world context. Intersection partners with cities, transit systems, airports, and real estate developments around the globe, as well as advertisers seeking to reach audiences on a global, national, or local scale.